Like everyone and their mother, I’m on a New Years health regime. I’m drinking less, exercising more, and trying to be mildly thoughtful about what I put into my body. 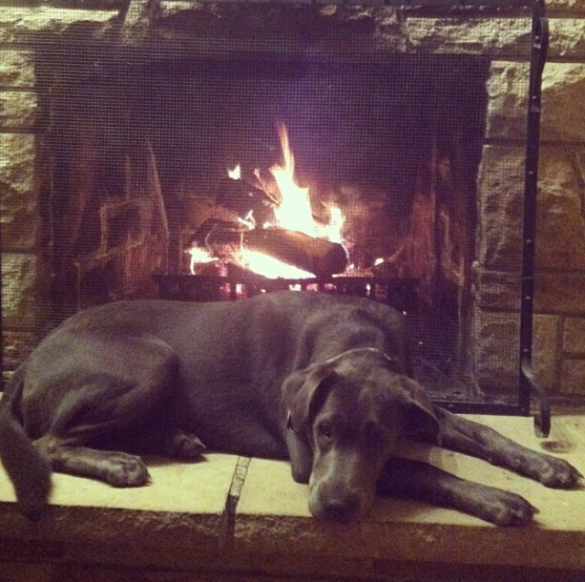 Lou’s New Years Resolutions: Take More Naps by the Fire. Nailed it! Unlike everyone and their mother though, I’m going to admit I don’t really like it. I know that I’m supposed to say that I feel so much better when consuming lots of kale and chard, that I sleep like a baby, and have skin like a dewy blossom on a summer morning, but I don’t. I like cheese, and pasta, and a big burger, and an even bigger Cab Franc. It’s true. Alas, as is often the case, the trick to successful life changes is balance and moderation, so amidst the healthy breakfasts and walking lunches, there have to be a few moments of indulgence thrown in. This Gourmet Mac and Cheese is sinfully delicious. Perfectly cooked pasta, nestles in among a sharp cheese sauce, punctuated with flavor pops through the sun-dried tomatoes, and brought to an element of elegance via the chicken and mushrooms. It freezes beautifully, so you can either make half now, and freeze half for later, or bake it all now, and freeze individual portions in foil for a lazy weeknight dinner. That is…if there’s any left. What are you doing this January to start the year off right? Preheat oven to 400. In a large pot of boiling salted water, cook pasta 3 minutes short of al dente; drain pasta, and return to pot. Add chicken and pasta to pot; season with salt and pepper. If cooking one now and one later, divide between two, 2-quart baking dishes. Otherwise, put all into an 11×17 baking dish. Sprinkle with remaining Parmesan. Hey, you can’t be doing TOO badly — I spy some greenery on that plate! I like the way you think! Spinach salad with apples, blue cheese, and toasted walnuts, tossed in a balsamic vinaigrette. Happy 2013! A lovely low-fat salad; just what the doctor ordered. Haha…you caught me Pm! Do you do New Years resolutions? If so, care to share? NAM NAM NAM (and that’s not shorthand for a country). Come visit and I’ll make you WHATEVER you want Madeline! Everything in moderation – even moderation! 😉 You know I have a weakness for mac n’ cheese and that one looks fab! A brilliant quote if I ever did hear one. I’m realizing you might be starting to think all I ever make is mac ‘n’ cheese. Not true! I promise there are some healthy recipes up my sleeves as well. We have to have a little decadence in our lives once in a while. 🙂 And a large Cab Franc too! Looks absolutely delish Erina! Thanks Karista…what I really want to make is that cauiflower fettucine you posted! On my wish list! This year i opted not to make any resolutions…everytime i do i stick with them for a little while and then i fall off,then im left just feeling depressed. I’ve decided to just make some changes gradually and go with the flow. There are some things i wanna work on and i am going to but id rather not call them resolutions. I like your style, Keisha! Mine are the same…more like “Good life tips” rather than resolutions. Care to share what a few of your favorites are for 2013? Well I would definitely like to eat healthier, Im also working on not procrastinating so much and i would also like to challenge myself in the kitchen more and i guess the big one is to just generally be a more happy person by saying and doing the things that make me happy. Here, here! All good life lessons to live by. Keep us posted on how they’re going. A little virtual pep squad is never a bad thing for anyone! Thanks Albert! This is a crowd pleaser, for sure. Yes indeed! I like your strategy. Stunned by your blog name…your blog just glowing out of thousands of other blogs..continue to keep up your great work!! I’m happily following you!!! Wow! Thank you! I’m having fun with it, that’s for sure. Congrats on your new site as well. 2013 is off with a bang! You wont miss anything without the chicken…I toyed with leaving it out in this version, but I know some of the boys “need” meat for it to be dinner. Spinach or artichoke hearts would be great substitutes! Christine! Never put “Don’t eat Gourmet Mac and Cheese” on a resolutions list! That’s just setting yourself up for failure! It never gets that cold here in Seattle, but I pretend I’m back in Boston and take full advantage of the hearty winter fare. It’s going to be 5 degrees in MA tonight! “Malark and cheese” could be the new name, sounds too good to be bad ! My resolutions of 2013: Breathe, dance, listen. Not exactly earth shaking, but reachable. Brilliant resolutions. You’ll have to practice them when you arrive. Lou is so cute! Looks awful cozy there by the fire. Thanks Tammy. She’s a sweetie, especially when she’s not chewing on her big brother The Duke! You’re doing the green juice? That is commitment. What’s the recipe? Hi Erina! Just a quick note on a typo. The ingredient list says sharp cheddar, but the instructions refer to provolone…? Which is better? Ah!! Good catch. I’ve done both but prefer cheddar for the sharper flavor. That said, you frankly could use just about any shreddable cheese in your fridge. That recipe really takes mac ‘n cheese over the top! Can’t wait to try it! It definitely makes it a serious indulgence, but sometimes that’s worth it in my book. Fact: Mac and cheese should be a part of any weight loss plan. Just not every single day.. It’s a gradual thing so take you time and eat a little Mac and cheese on your way there. Agreed! It’s become a special treat instead of the staple it was in college, which is fine by me! This looks soo delicious and comforting and gourmet…pretty much like everything you post! My brother would love this! The boys do indeed go nuts for this one! I think my 20 year old cousin ate three servings. I couldn’t agree more! It doesn’t sound logical, but for some reason being too too TOO healthy, doesn’t seem all that healthy in the end. A little indulgence is absolutely necessary! Absolutely! There has to be a balance, otherwise there is zero chance of sticking with it. Hahaha I WISH I could say I sleep like a baby and have skin like a dewy blossom and feel all-around awesome. But so far, my detox has left me feeling bloated and I pee about 892375928x a day. But umm…hopefully this stage will pass. At least I get to eat three square-ish meals a day! And when I’m done with this detox, your mac and cheese is on my list to make. I love me some mac and cheese out of the box, but I love the gooey-ness of the cheese when you make it at home! Okay, this officially made me laugh out loud. Dare I ask what detox you’re doing?!? Instead of wine I’m drinking hot water with fresh ginger, lemon juice, and honey each night. Trying to tell myself it is HEALTHY and I LIKE IT! Me too. 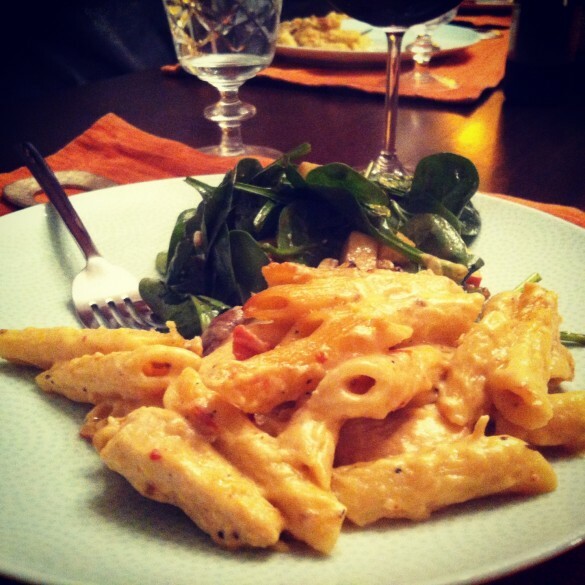 I can easily get tricked by this delicious mac and cheese (and hooray for gourmet version!) and forget all about eating healthy. But it’s okay we enjoy once in a while and this does look so good! I love your idea of getting tricked. I actually like kale and chard (weird, I know). But I like mac ‘n cheese better. 😉 And I’m with you on really disliking all the healthy eating I do at this time of the year. Made necessary by all the unhealthy eating I did between Halloween and New Year’s. Great idea to take a break from all of this healthiness and indulge in something truly sinful from time to time. 😉 Good stuff – thanks. Thanks John. I have to agree though. For me the gauntlet was Thanksgiving to New Years and it was ugly. Parties, wine, desserts, wine, working lunches, wine. So. Much. Consumption. Feels good to be taking things easier, even if I don’t like it. Drink more champagne is your New Year’s resolution???!! Please tell me more about this. I am fascinated (and very jealous). Thanks Christie!! I love the combination of the mushrooms and sun-dried tomatoes too. I almost wonder if it would be better sans chicken…guess I’ll have to make it again! We did eat it for days, Paula! 🙂 I love that you can freeze the individual portions in foil after cooking it if you want. Come home from work, through foil packet in the oven, and you’ve got a delicious dinner in an hour that is maybe even better than when it first comes out of the oven.